This light and moist low-carb almond sponge cake is sandwiched together with a smooth, luscious cream cheese frosting and topped with fresh berries to create a beautiful, patriotic cake without all the carbs and sugar! Firstly make the cake; pre-heat the oven to 325F/165c. Starting with the ingredients in stage one, whisk the eggs with the Sola sweetener until very light and fluffy, this is best done with an electric whisk. Set to one side. Sift the coconut flour, almond flour and baking powder into a separate bowl, set to one side. Melt the butter and set to one side. With the ingredients from stage two, whisk the egg whites with just 1 teaspoon of the Sola sweetener until you have stiff peaks, at this point gradually whisk in the remaining Sola sweetener and continue to whisk until glossy. Pour the dry ingredient mixture and melted butter into the beaten whole eggs and stir until well combined, then gently fold in the egg whites. Make sure you do this very gently because the small bubbles in the egg whites are what gives the cake its light, spongy texture. Divide the mixture between two quarter size sheet pans (9x13 inch), which have been lined with parchment paper, gently spread out. Bake for 20 to 25 minutes until risen and golden brown, the cakes are delicate, so cool them in the pans for 1 hour at room temperature, or in the refrigerator for 30 minutes. To make the frosting, place the cream cheese, vanilla and Sola sweetener in the bowl of a stand mixer fitted with the whisk attachment. Whisk for approximately five minutes, until the mixture is smooth and creamy. You can also use an electric hand mixer. Once your cream cheese mixture is smooth and free of any lumps, gradually add the cream, then turn up the speed and whisk until stiff. Refrigerate until needed. To assemble the cake, remove the cakes from the pans, place one cake on a serving platter and spread over half of the frosting mixture, top with the second cake and the remaining frosting. 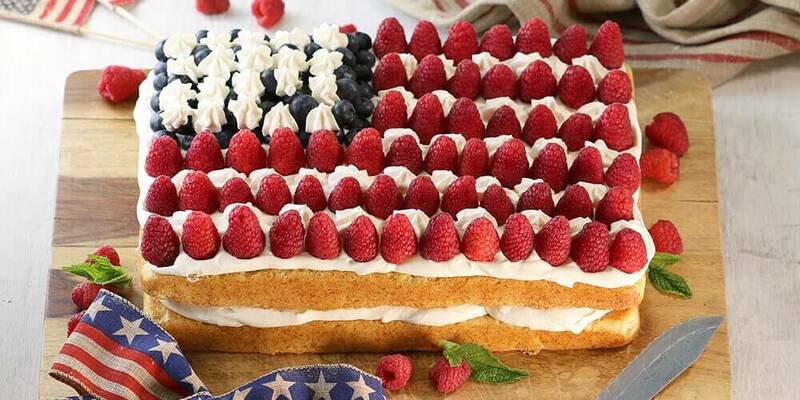 Decorate with raspberries and blueberries to create an American flag. Store the cake in the refrigerator until needed.